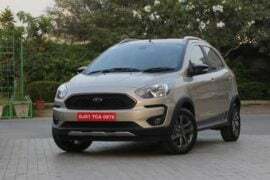 Ford Freestyle compact utility vehicle or CUV marks the American automaker’s entry into the hatchback crossover segment in India. 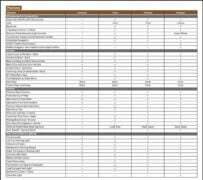 Here is everything you need to know about it. 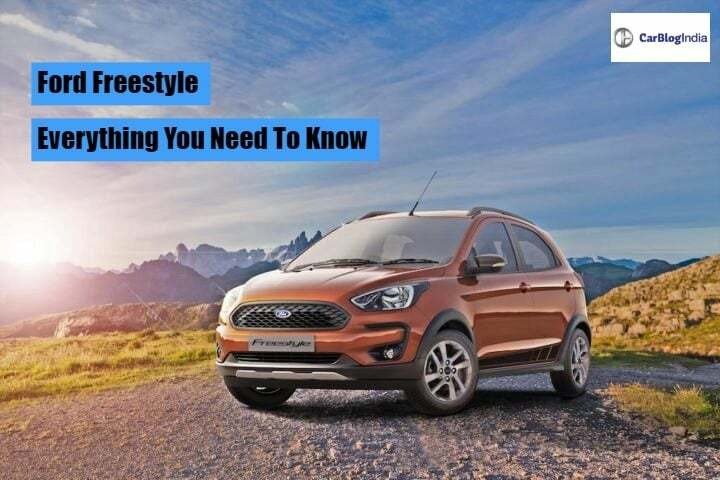 The Ford Freestyle is a crossover body style vehicle based on the Figo hatchback. 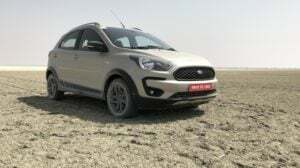 To differentiate it from the existing breed of hatchback based crossovers, Ford is calling the Freestyle a CUV, or a compact utility vehicle. Though it sports a similar profile to that of the Figo. However, since it is based on the mid-cycle update of the hatchback, comes with some minor cosmetic differences. This is in addition to the aggressive body cladding and the increased ride hide. 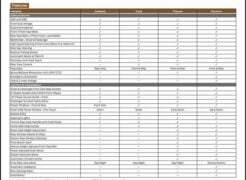 In addition to this, it also comes with an all-new dashboard layout and an improved feature list. In this article, we tell you all that you need to know about this vehicle. 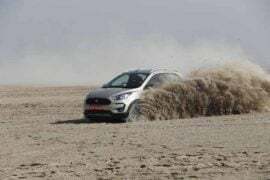 Ford India made the first public debut of the Freestyle in India at the start of this year. 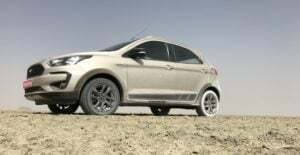 Today, ford India has launched the much-awaited Freestyle in India at a starting price of INR 5.09 lakh. As mentioned before, the Freestyle is essentially the hatchback crossover version of the Figo. Consequently, the prices are slightly premium than the standard hatchback version. 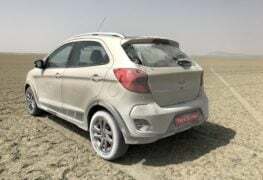 The base variant of the Ford Freestyle starts at INR 5.09 lakh while the top spec version retails for INR 7.89 lakhs. (ex-showroom). The Freestyle crossover is going to get a new petrol engine, while the diesel engine remains the same as the current spec Figo hatchback. The new petrol engine is a 1.2-litre, TiVCT motor from Ford’s Dragon series. It produces 96 BHP of power along with 120 Nm of peak torque. The diesel derivative is going to come with the same 1.5-litre, TDCi oil-burner. This engine is good for 98 Bhp of power along with 215 Nm of peak torque. Both the variants are going to get a 5-speed manual gearbox as standard across the range. Talking about the mileage, the petrol engine of the Freestyle is expected to give a fuel efficiency of 21 km/l. While the diesel engine promises a mileage of 25 km/l. The Freestyle comes with the basic silhouette of the Figo facelift. The front profile of the crossover looks very sharp, thanks to an aggressively styled bumper. In line with all the hatchback crossovers, this car too comes with black plastic cladding all-around. The car also comes with faux skid plates, both at the front and at the back. Furthermore, the rear profile of the vehicle looks very similar to the current spec Figo. However, just like the front, it too comes with an aggressively designed bumper. Since the Freestyle is based on the Figo facelift, the cabin of this CUV shares its design with the same. 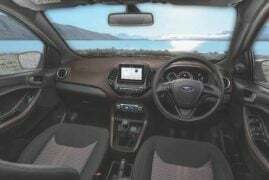 The dashboard comes with a neat and sporty layout, indigenous to Ford cars in India. 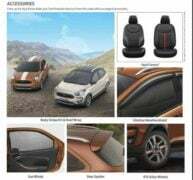 You can clearly see that the design takes its inspiration from the one that we see on the EcoSport facelift. This compact utility vehicle measures 3954 mm in length, 1737 mm in width and 1570 mm in height. The Freestyle is going to have a wheelbase of 2490 mm. While the boot space will stand at 257 L.
The Freestyle currently retails in India in a total of four different variants. These are Ambient, Trend, Titanium and Titanium+. These variants are available across the petrol as well as the diesel power terrains. This hatchback crossover is available in a total of six different colours. These are Canyon Ridge (Brown), Smoke Grey, Moondust Silver, White Gold, Oxford White and Absolute Black. The Freestyle competes in the hatchback crossover segment. This means, it primary rivals are Hyundai i20 Active, Toyota Etios Cross, Honda WR-V, Maruti Celerio X, Volkswagen Polo Cross and Fiat Aventura.